A heavy-duty commercial/residential grade sliding hardware system designed to carry heavy doors. Heavy-duty extruded aluminum I-beam tracks, strong four wheel adjustable hangers with machine turned ball bearing wheels and heavy-duty door guides. 11-16 gauge zinc trivalent plated steel parts. 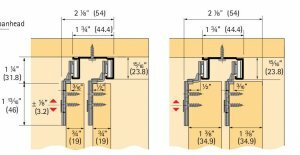 The 200SM commercial grade sliding bypass door hardware features side mounted door plates allowing the hardware to be fastened to the door face rather than top edge of the door. The 200SM is ideally suited for door panels made from plywood, particle board, MDF or other material that will not hold a screw on its edge and side mounting is required. A heavy-duty commercial/residential grade sliding hardware system designed to carry heavy doors. Heavy-duty extruded aluminum box track features low friction convex rails for easy rolling. Strong 3-wheel hangers are completely adjustable and feature machine turned ball bearing wheels for smooth operation. Parts are made from 14-16 gauge steel and are zinc trivalent plated for quality appearance. The 100SM commercial grade sliding bypass door hardware features side mounted door plates allowing the hardware to be fastened to the door face rather than top edge of the door. The 100SM is ideally suited for door panels made from plywood, particle board, MDF or other material that will not hold a screw on its edge and side mounting is required. A medium-duty commercial/residential grade sliding door hardware system. Compact extruded aluminum box track features low friction convex rails for easy rolling. Strong 3-wheel hangers are completely adjustable and feature machine turned ball bearing wheels for smooth operation. Parts are made from 14-16 gauge steel and are zinc trivalent plated for quality appearance. Commercial/residential grade sliding bypass hardware system with aluminum fascia track that hides hangers from view. Three wheel hangers ride on low friction convex rail. Door guide with pivot action automatically align doors with guide post. 14-18 gauge zinc trivalent plated steel parts. Patented tricycle hangers with 1 [25mm] dia. wheels ride smoothly and quietly. Looks like that will do it. Should be able to get around to it this coming weekend, i'll keep ya posted how it turns out. What is a 'bypass' closet door. A 'bypass' closed door is a type of closet door that has a double track system with double doors. One door is on one track and the other door is on the other track allowing them to slide past each other.